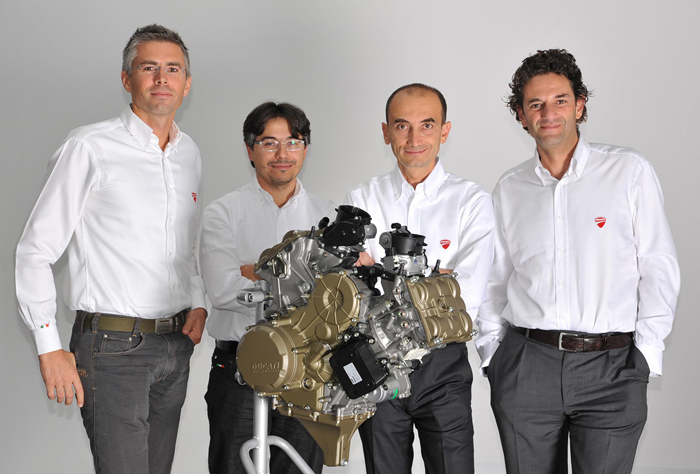 Pictured with their new Ducati SuperQuadro 1199 Engine are, from left: Diego Sgorbati (Marketing Director), Vincenzo De Silvio (Engine Design Manager) Claudio Domenicali (General Manager), Marco Sairu (Engine Project Manager). October 10th, 2011 - With just a matter of weeks to go until the final unveiling of Ducati’s brand new 1199 Panigale at the EICMA International Motorcycle Show in Milan (10-13 November), the Italian manufacturer now reveals the secrets behind the awesome power of its 2012 Superbike. The most extreme benchmark ever Ducati’s latest engine, the Superquadro, goes beyond the barriers of engineering to enable the introduction of a futuristic Superbike today. Its no-compromise approach to design, combined with Ducati’s Italian innovation has now set the most extreme benchmark ever and stands as the latest milestone in Ducati’s long and iconic history of Superbike engines. Ducati engineers were given a near impossible design brief to create the new generation Superbike engine for the Ducati 1199 Panigale. Increase power, torque and userfriendliness and reduce overall vehicle weight and scheduled maintenance costs seemed impossible tasks, but given a “blank canvas” to create the new power-plant and encouraged to think outside-of-the-box to achieve the unachievable, engineers have finally ticked all the boxes. power appropriate to the rider’s style and environment. Its construction has enabled a radical reduction in overall vehicle weight and, further identifying Ducati’s constant pursuit of performance perfection, major services have been extended to 24,000km (15,000 miles). Only Fabio Taglioni’s masterpiece 90° L-twin configuration and Desmodromic valve control have been retained from previous engines. Everything else is new. That Black Box bolted onto the right side of the motor is actually the oil cooler. Without a frame to bolt it to, the oil cooler needs to go somewhere and placed here it gets good air flow from the front of the fairing, it elimates the weight of external oil lines and allows quicker engine changes. Note also, the even deeper oil sump pick-up to prevent oil starvation in racing and for finish line wheelies which this new bike will be doing a lot of! With the engine designed to be a fully stressed member of the chassis, its architecture has been completely re-calculated to provide the best possible vehicle construction for layout, weight distribution and strength. The cylinders, which remain at 90° to each other, have been rotated backwards around the crankcases by a further 6°, until the front cylinder is 21° from horizontal. This has enabled the engine to be positioned 32mm further forwards for improved front / rear weight distribution in addition to perfectly positioning the cylinder head attachment points for the 1199 Panigale’s monocoque frame. In addition to cylinder position, the crankcases now use shell main bearings for the crankshaft, previously only used by Ducati on the Desmosedici RR engine. Removing the roller bearings has enabled an increase in diameter of the crank journals for enhanced rigidity and an increase the crankcase section around the main bearing area for improved strength in line with the Superquadro’s extreme power output. The shell bearings are forcefed oil from internal drillings within the main bearing pillars to keep the new crankshaft well lubricated and is quickly scavenged back into the sump with the introduction of a new Ducati feature, a highly efficient MotoGP-style vacuum pump. The pump is driven by the main oil pump shaft and effectively maintains constant vacuum in the crankcase area below the pistons, reducing atmospheric resistance during the downstroke of the piston and controlling the internal “breathing” of the engine. 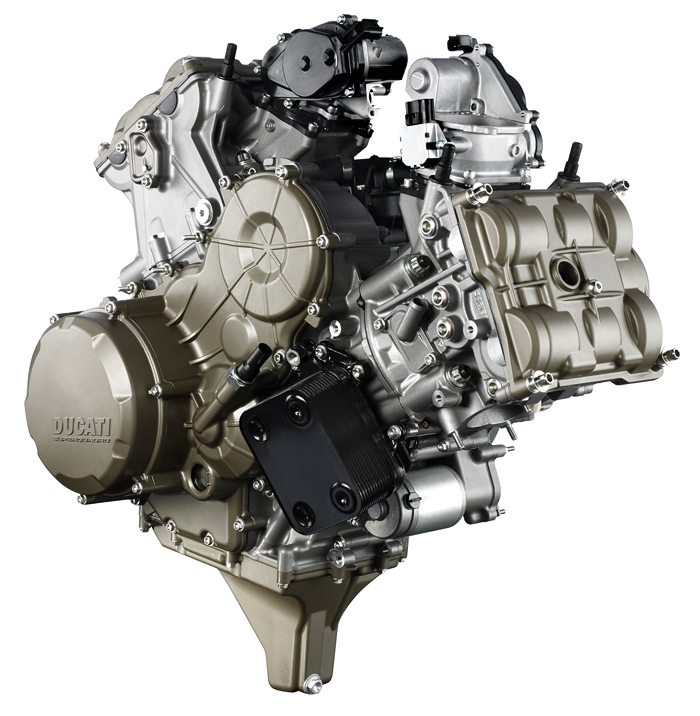 In calculating the optimum configuration to achieve the next big step forward in power output for the L-twin engine, Ducati and Ducati Corse engineers increased engine speed and enhanced breathability with the incredible bore and stroke of 112mm x 60.8mm. The intense study of power and ridability resulted in an output of 195hp @ 10,750rpm and 98.1 lb-ft (13.5kgm) @ 9,000rpm. The new bore and stroke ratio of 1.84:1 effectively increases rpm with the ultra-short stroke of the crankshaft and increases the cylinder area to enable increased valves diameters. Inlet valves have increased from 43.5 to 46.8mm and exhaust valves from 34.5 to 38.2mm. With such large inlet valves operating at higher rpm, the intense inertial forces have been controlled by using titanium instead of steel, a solution only previously used on full “R” models. 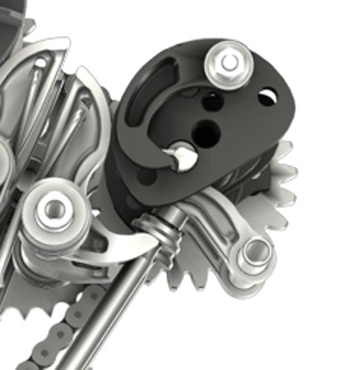 The new valves are actuated by racing-derived rocker arms, 'super-finished' for reduced friction and fatigue and then coated in polymeric-like carbon (PLC), a process originally developed for the aerospace industry. The race-derived Superquadro pistons have a distinctive double-ribbed undercrown to achieve high strength and reduced friction by using minimal piston wall surface area. Using technology developed by Ducati Corse, the design enables reliable operation of the 112mm diameter pistons when performing at high rpm. The improved volumetric efficiency of the increased inlet valve diameters is further capitalised on by increasing the oval throttle body dimensions from an equivalent diameter of 63.9 to a massive and high-flowing 67.5mm. The Ride-by-Wire throttle bodies feed air across twin injectors per cylinder, one positioned below the butterfly for enhanced flexibility and one above for outright power. With such enhanced “breathing”, the challenge for the Superquadro’s Design Engineers was to program performance-optimised fuel mapping for a smoother cycle-to-cycle engine operation, without compromising emissions. To achieve this, Ducati introduced a secondary air system that completes the oxidization of unburned hydrocarbons and effectively reduces HC and CO levels. The system is activated when the engine ECU recognises specific conditions in the engine’s operation via the lambda and throttle opening sensors. It then opens a valve enabling a flow of clean air from the main airbox to a reed valve situated in each cylinder head, which enables one-way flow into an air gallery exiting into the exhaust port close to the exhaust valve. Entering the hottest point of the exhaust gasses, the fresh charge of air enhances the burn environment, eliminating any unburned fuel that escapes during the exhaust cycle under certain conditions. 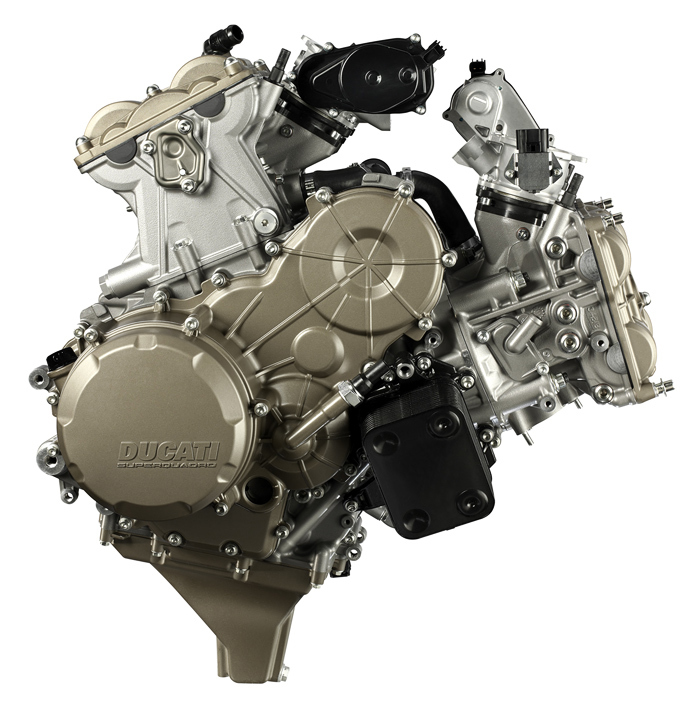 With such an extreme engine, never before has Ducati's unique Desmodromic system been so vitally important. 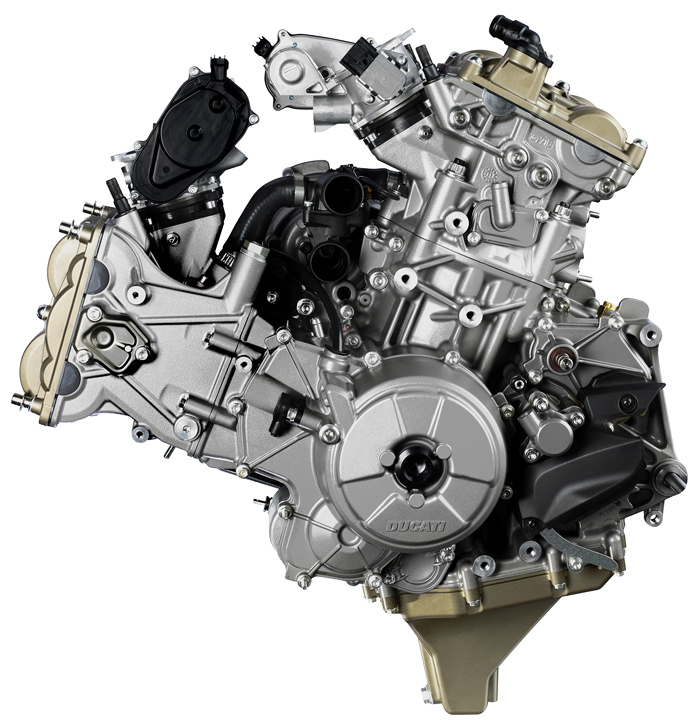 With the high engine speeds at which the Superquadro operates combined with such large valves, it would be impossible for the valve’s rocker-arm to follow the steep closure profile of the cam lobe using normal valve closure springs. The Desmo system actuates valve closure mechanically with the same method and accuracy as it opens, enabling steep cam profiles, radical cam timings, large valves and high operating speeds. This system is used on every single Ducati motorcycle and is constantly proven on Ducati Corse’s World Superbikes and Desmosedici MotoGP bikes. drive route and, tensioned automatically, provides continuous reliability and further reducing the cost of routine maintenance. On the end of each exhaust cam drive gear is a centrifugal flyweight which retracts at speeds below tick-over to rotate a “protrusion” from the concentric section of the cam, thus creating sufficient inlet valve lift to act as a de-compressor (eg: a compression release) . This ingenious device enables the Superquadro engine to be started easily without using a larger battery and starter motor, which has reduced overall vehicle weight by approximately 3.3kg (7.3lb). 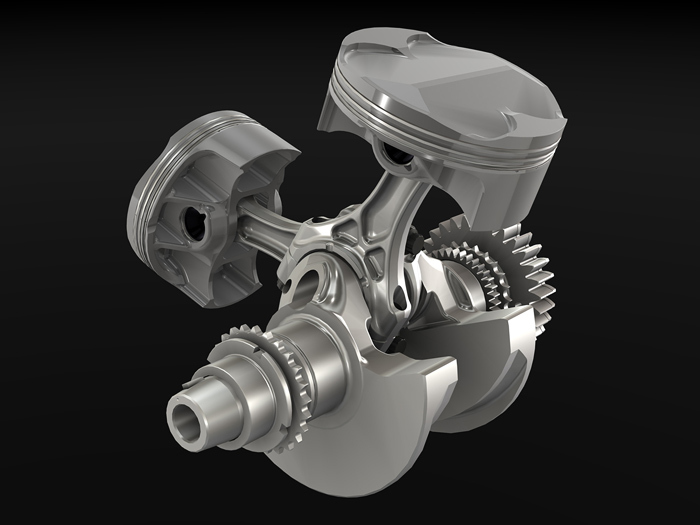 When the engine starts and the camshafts begin to rotate at tick-over speed, the centrifugal flyweight flicks out, retracting the “protrusion” back into the cam and allowing complete valve closure for full compression. This innovative feature further underlines the lengths to which designers and engineers have worked together in the single-minded pursuit ofweight-saving. from the engine. While enhancing frictional efficiency, this also results in a rider-friendly light clutch lever “feel” at the handlebar. Conversely, when the drive force is reversed (over-run), the mechanism reduces pressure on the friction plates, enabling a true racing “slipper” action, reducing the destabilizing effect of the rear-end under aggressive downshifting and provide a much smoother feeling when closing the throttle or down-shifting under normal riding conditions. most powerful twin-cylinder production engine on the planet and is destined to power the new Ducati 1199 Panigale with absolute performance perfection. Marco Sairu Many questions. I'll try to answer. First: we have evaluated both the chain/gear and full gear but this second option was too heavy. Diego Sgorbati - No cassette gearbox in order to maximize stiffness and reduce weight. Diego Sgorbati - The engine has been designed to work in conjunction with a monocoque frame. In theory, it is possible to use it with a standard frame but would lose the most of its design benefits. The magnesium cover on the right side of the engine seems to host an enormous water pump, large enough to cool an AMG 6.3. Or maybe something else, something more? What exactly is under it? Why did you go away from the iconic dry clutch? Marco Sairu - It was a tough decision. At the end, we considered many factors. Fist of all, the weight. If you consider the clutch itself, the clutch cover and some other components, the wet layout is lighter. Moreover, it has longer maintenance intevals. In terms of performance, the dry clutch is really performing, but this layout has slipper & assist devices so also in race applications we belive that the behaviour is really good. For us it was the best way to go. At what engine speed does the rev limiter kick in? Can you comment about the riding modes that will be available that are alluded to on the Superquadro microsite? Is this new engine and valve gear design applicable to the aircooled bikes as well? Marco Sairu - No this is not in our plans and it is not needed on the air cooled engines. 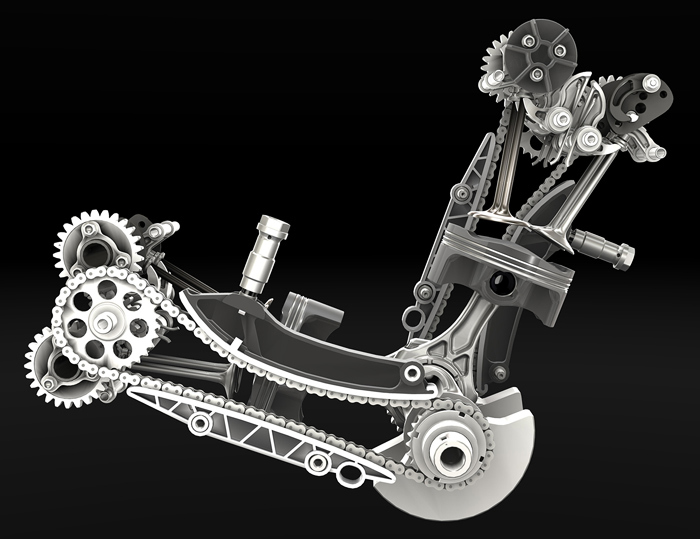 The Superquadro chain/gear layout was choosen for inertia loads, related to high revs and masses. Diego Sgorbati - The mixed chain-gear drive train is a technical choice driven by the need of controlling valves of extremely big size at high rpm. Ducati dominated the 2012 World Superbike Championship using the FIM restrictor plates on the Testastretta engine. Since the new Superquadro has even more performance and may possibly be restricted even more by the FIM… have you considered, is there a possibility the 1199 could also be built and homologated as a 1000cc engine so it could run unrestricted in World Superbike? We hear that Troy Bayliss would like to return to World Superbike to race the new 1199. Could there be a possibility that Troy might race the 1199 in 2012 European Superstock, before it is eligible for WSB class in 2013? This would be a great premier for the new bike without Troy stepping on the toes of Carlos Checa and his title in the WSB class on the current 1198 bike. What can you tell us about reliability testing? Was the desmoquadro bench-tested over 100,000 simulated miles? How does it stand up compared to the other liquid-cooled designs? Diego Sgorbati - We have to fullfill various tests. On bench we perform a durability test which simulate the real world use of the engine, and a track simulation test (usually referred to as "Monza cycle", you can guess why!). On vehicle we perform reliability tests on high speed ring, track tests and finally durability tests on open roads. The standard the engine have to fullfill in each test are Ducati known how.